EDIT: This bundle is no longer available. It was a great deal, but the consortium of prepper authors who put this together were true to their word about this being a very limited time offer. They’re talking about some other products in the future. We’ll let you know of any worthwhile specials that we find. But sometimes the best way to accomplish one or more of those goals is to recommend a product. This is one of those times. A group of preparedness authors have banded together to offer a package deal of their books and instructional materials at a discount so deep it’s too good to pass up. It’s only $29, but that price is only good until this coming Monday (September 23, 2013). I don’t know what the price will jump to then, but it is an absolute steal at this introductory price of $29. They say the retail value of the package is $700. I haven’t done the math, but a cursory glance at the wealth of materials will confirm that they’re darned close. I bought one for myself right away. It was a no-brainer. I got enough stuff in this bundle to keep me learning and prepping through the cold winter months to come. The Ultimate Survival Bundle is a collection of downloadable books, videos, and audio presentations that covers most of the critical areas of emergency preparedness or survival. Included in the package are a couple of books that give a comprehensive treatment of preparedness and it is well worth the bundle price of $29 just to get those two books. They are Making the Best of Basics (edition 12.5) by James “Doctor Prepper” Stevens, which sells on Amazon for $28.99 (one cent less than this entire bundle); and The Untrained Housewife’s Guide to Getting Prepared (also sold on Amazon). Click on this link to go to a page that gives details about all of the many products included in this package. Besides books, there are also a few videos that you can download. Two of them are instructions on how to build a greenhouse, companion videos to a book on that topic that is also a part of the package. These video files are very large and will take a while to download. One is two hours long (2 gigabyte file size) and the second in a little over an hour long (1 gigabyte). Another video is a half-hour presentation on hand-to-hand self-defense techniques. I could go on, but I’m going to try to contain my enthusiasm. The bottom line is that if there’s not something in the Ultimate Survival Bundle that gets your juices flowing, you’re not a prepper. At $29, this is one of the biggest bangs for the buck that I’ve encountered in a very long time. I can blow that much on pizza in a week. This is a deal that will give me something to chew on for much longer than that. When you’re ready to order, click here. Get it while you can get it cheap. I’ve been learning about solar power. Prior to prepping, I didn’t know anything at all about solar energy. I’d guess that a lot of you are also in the dark when in come to solar. From what I’m reading and learning, I think we’d do well to begin looking into it. Solar power has been around for a long time and it still hasn’t really caught on. I think my first encounter with practical solar power was with a small calculator that we powered by a photosensitive strip. I still use one of these on my part-time job a couple of times a week. Solar power has come a long way from the novelty of being able to run a calculator with it. It has many practical applications that can benefit you now and could be a game changer for you if the power grid ever goes down. Let me share some of what I’ve been learning. Solar power works well, but it works better in some places than it does others. 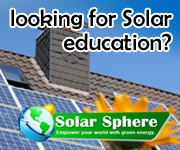 Solar panels work best when they are exposed to direct sunlight for prolonged periods of time. Not surprisingly, solar is a better option in Phoenix than it is in Seattle where the annual Rain Festival begins on January 1st and runs through December 31st. Another area of the U.S. that is not optimal for solar is the Great Lakes region (where your humble blogger happens to live). If you live in a cloudy area, don’t tune me out just yet. You’ll see that there might still be a place for solar power in your energy plan. Solar is still expensive. There are a number of reasons for that. First, it’s still in the developmental phase. New research is continually being done to make solar powered systems more efficient, more durable, more portable, and more economical. All that trial and error costs money. The other major factor in the cost of a solar system is the economy of scale. As soon as solar catches on and becomes more popular, mass production will begin in earnest. Build a few units costs a lot. Building thousands upon thousands drives the cost per unit way down. We’re not there yet, so the early adopters are bearing the brunt of the cost. A taxpayer may claim a credit of 30% of qualified expenditures for a system that serves a dwelling unit located in the United States that is owned and used as a residence by the taxpayer. Expenditures with respect to the equipment are treated as made when the installation is completed. If the installation is at a new home, the “placed in service” date is the date of occupancy by the homeowner. Expenditures include labor costs for on-site preparation, assembly or original system installation, and for piping or wiring to interconnect a system to the home. If the federal tax credit exceeds tax liability, the excess amount may be carried forward to the succeeding taxable year. This 30% tax credit applies to solar-electric systems, solar water heating solutions, and fuel cells. Knocking 30% off the price of the hardware and installation can make solar energy much more attractive and affordable. And there may be other credits offered by your state or local governments. Contact your local electric utility for current information regarding your locale. If you want more info about these on-the-grid systems, a good source is Solar Sphere. They’ve got a ton of good information and some interesting looking products. They also have a lot of off-the-grid stuff. An on-the-grid solar system is one that is hooked into your home’s electric power utility. The solar power that you collect from panels mounted on your roof or elsewhere feeds into your whole-house electrical system. The solar power is used first, causing you to not draw as much juice from the electric company. Your electrical meter will visibly not spin so fast. If at any moment you’re generating more power than you’re consuming, the meter will actually spin in reverse as the excess energy is fed into the grid. At this point, the electric company is paying you for helping to supply energy for your community. How cool is that? While we’re on the topic of saving money, I think the tax credits mentioned above only applies to this type of on-the-grid solar application. 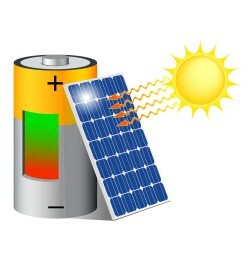 Off-the-grid solar products are those that are not connected into your home’s electrical system. These are portable, stand-alone units that vary greatly in size and capacity. The smaller models are self-contained units, but the larger ones have three main components: the solar panel(s) that collect the energy, a battery that stores the energy, and an inverter that converts the direct current (DC) power into alternating current (AC) electricity that most of our electrical appliances and gadgets run on. Small units could be the size of a tablet computer and could be used for recharging an iPad or a smartphone. The batteries for medium-sized units would be about the size of a car battery and could power emergency or outdoor lighting systems, recharge laptop computers, or even run a TV for a couple of hours. Large units (think something the size of an ice chest) are sometimes called “gas-free generators” and can power more appliances for a longer period. A large unit fed by a nice array of solar panels could keep your freezer going for a long time. Oddly enough, these solar batteries aren’t just charged by solar panels. You could charge them by plugging them into an electrical outlet and keep them charged until your power goes out or you need to take them away from a conventional electrical source. These systems are used by campers, salesmen in tradeshow booths who don’t want to pay the outrageous electrical hook-up fees charged at some venues, and people who need to do demonstrations or presentations where there is not convenient electrical outlet, etc. It’s conceivable that you could have a use for one of these gas-free generators and never hook it up to a solar panel at all – just recharge it from your electrical outlet and take the generator out in the field with you. But if you’re going to use it outside, having one or more solar panels to help recharge your generator just makes good sense. If you want to learn more about off-the-grid solar products, I’d start looking at Goal Zero. They are a leading brand with some very cool looking products. If you found this article helpful, please share it with a friend! Just because I’m a prepper doesn’t mean that I don’t like comfort and convenience. Whether the electricity is off for five minutes, five days, or five weeks, I want to maintain as normal a lifestyle as I possibly can. So I’ve been looking into appliances that will work when the power goes down. As a baby step in that direction, I bought two hand-crank powered lanterns . The lanterns were cheap at less than $20 each (when I bought them in September 2012 — they’re almost $25 each now). I keep one on the first floor and the other one in my bedroom. They’re small and lightweight, making them easy to store, transport, and use. I’ve had the opportunity to use the lanterns during a couple of short power outages we’ve had. In the past, I’ve scurried to find a flashlight and wondered if I’d be able to find one with batteries in it. If it had batteries, would they still work? Would they be corroded? Would the corrosion ruin the whole flashlight? If there were no batteries in it, would I be able to find enough of the right size to make this thing work? When you’re stumbling around in the dark with no idea how long the power outage will last, you don’t need to be doing a Chinese fire drill just to find a flashlight that works. So in that sense, these little hand-crank lanterns have been a real joy. I know where they both are, I can find them in the dark, and I no longer have to be concerned about batteries for basic lighting. That said, these little lanterns aren’t a substitute for a good flashlight. A better way to think of them is as a good substitute for a candle. They put out enough light to keep me from bumping into walls, but it’s not like I’m going to read the newspaper with one of them. Not enough lumens. I don’t know how much light they put out, but I know that it’s just enough to not be in the dark anymore. Like I said, this was a baby step for me — one that I’ve been very happy with and can recommend wholeheartedly to others, but don’t expect too much from them. At the same time that I bought the lanterns I also purchased a hand-crank emergency radio . I haven’t had any real need for this device yet, but I’ve tested it and am very pleased to have it as a part of my emergency supplies. The Ambient Weather model WR-111 Adventurer Emergency Radio has a name so grand that you’d think that it should come with a decoder ring. And it very nearly does! This little radio weighs just half a pound and is small at 5.5” x 2” x 3”, but it has a lot of useful capabilities. First of all, it can be powered in any of three ways: hand-crank, USB port (to power it from a charged laptop, recommended to fully charge the device before use), or its own built-in solar panel. I’ve tried the hand-crank and the solar panel, and both work like a charm. The radio receives AM, FM, and NOAA weather alerts. Besides being a radio, it also has a built-in LED flashlight and can be used to charge your cell phone. I remember scenes on the news from a couple of the most recent severe hurricanes of seeing crowds of people huddled together around a multi-outlet power strip that was plugged into a generator, all waiting their turn to charge their cell phones. I don’t want to be one of them. Which is the whole point of being a prepper. I don’t wanna live like a refugee. The other hand-crank kitchen appliance is one that I’ve had for years, long before I ever thought there was a need for prepping for anything. It’s a salsa maker . If you don’t already have one of these, you need one. I have an expensive electric food processor that I rarely use, but I haul out the cheap hand-crank salsa maker frequently. (OK, not as frequently as Sandy would like me to.) Besides being great for making fresh salsa, it’s terrific for doing a multitude of food processing jobs. Anything that needs to be chopped, whipped, beaten, or stirred can be done in this manually operated machine. Some people go off the grid because they like to rough it. Others, like me, do it kicking and screaming. I like convenience. I want to take as much of it with me as I can. These hand-crank devices help to maintain normalcy in a time of deprivation. Don’t go off the grid without them.